Join Dr. Bob Bacher and learn original Chen style Tai Chi for health and self-defense in this pristine tropical paradise oceanfront setting. Enjoy a fully relaxing stay in paradise while learning this ancient internal martial art. This training aims to reduce stress, reverse the aging process, cultivate vibrant health and wellbeing, and develop your practical self-defense skills. During this Tai Chi retreat, you will be accommodated at Pavones Riviera. It is located just a one-minute walk away from beaches, supermarkets, and restaurants. Pavones Rivera offers ocean, mountain, and awe-inspiring sunset views daily. You will wake up to the sounds of pounding surf and a symphony of birds and monkeys. Each private villa at Pavones Riviera accommodates up to four guests. This Tai Chi Vacation in Costa Rica includes two Tai Chi classes each morning and afternoon. The training lasts three hours daily. This is the standard package. When you like to add more Tai Chi classes, it is possible to schedule up to four hours daily by appointment. Dr. Bob Bacher practices and teaches Tai Chi daily with the same enthusiasm and joy as he did the day he started in 1969. He travels worldwide offering workshops and retreats, sharing Tai Chi’s original principles and practice methods as he learned from 19th generation lineage Grandmaster Wang Xi’an. Dr. Bacher’s goals are simple: to always strive to achieve the highest level of skill in Tai Chi, to be the absolute best teacher that he can be, and to share the beauty and health-giving properties of Tai Chi with as many people as he can. The venue of this holiday will be located in beautiful Pavones, Costa Rica. Pavones is situated in the southern Pacific region of Costa Rica. Pavones combines rainforest, jungle, green mountains, uncrowded beaches, magnificent sunsets, and the turquoise warm waters of the ocean. You will see scarlet macaws, toucans, dolphins, whales, giant sea turtles, monkeys, sloths, brilliant butterflies, and much more on a daily basis. Pavones is the perfect setting to completely relax and enjoy nature while you fully immerse your body, mind, and spirit in the practice of Tai Chi. Breakfast and lunch are included daily with a choice of several local restaurants to choose from, all within a few minutes walk of your lodging place at Pavones Riviera. Typical meals include rice and beans, salad, vegetables, plantains (a type of cooked banana), and whatever main course you desire. Vegetarian and vegan dishes are readily available, and the smoothies (batidos) are made from fresh tropical fruits that are grown locally (coconut, papaya, banana, mango, guanabana, and others). Portions are generous and all of our guests have been very happy with the quality, freshness, and taste of all meals! Service is always friendly with a smile, and most places speak good English and all menus are in both English and Spanish. There are three supermarkets all within a few minutes walk from your lodging place at Pavones Riviera. And your villa is equipped with a full kitchen. To reach Pavones, you can fly to Golfito Airport (GLF) and from there, take a taxi to Pavones Rivera (taxi is generally 80 USD). You can take the bus (Tracopa Bus) from San Jose to Paso Canoas and from there catch a taxi to Pavones Riviera in Pavones. 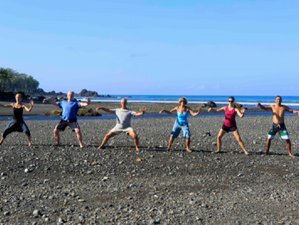 Tai Chi Retreats Costa Rica offer group classes, workshops, retreats, and private instruction in beautiful Pavones, Costa Rica. Book 2 persons for the price of 1 person. This offer valid for January and February retreats. Book your spot today!